The ultimate pressings of the Beach Boys discography from Analogue Productions! To meet the standards of Analogue Productions, our Beach Boys album reissues had a mission to achieve: Present the band's music the way that Brian Wilson — famed co-founder, songwriter and arranger — intended. Mono mixes created under Wilson’s supervision were how the surf rockin’ California crew rose to fame! And we’ve got ‘em! For the early part of the Beach Boys career, all of their singles were mixed and mastered and released only in the mono format — they didn't release a single in stereo until 1968. In those days, hits were made on AM radio in mono. And the mono of those times worked well for Wilson, who suffers from partial deafness. Still, apart from Surfin' Safari, which was mono only, the Beach Boys did turn in stereo masters on all of their early albums up until 1965. The Beach Boys Today! was the first LP for which they only delivered a mono master. Bottom line, the mono mixes were where Brian Wilson paid intense attention, and the dedication paid off! We’ve taken 10 of the most classic, best-sounding Beach Boy titles ever and restored them to their mono glory! But there’s no disputing that the close harmonies and one-of-a-kind rhythms of hits like “Surfer Girl,” “In My Room,” “Little Deuce Coupe” and more lend themselves naturally to stereo. So we’ve got your 2-channel needs covered with prime stereo mix versions as well. Mastered by Kevin Gray, most from the original master tapes, and now presented on Hybrid Mono SACD, these are awesome recordings to experience. With this Hybrid Mono SACD of Surfin' Safari you'll enjoy the smash hit title cut as well as "409,"Summertime Blues" and more as the fledgling Beach Boys proudly display their garage band roots in this, their debut album for Capitol Records! Their classic songs epitomize the spirit of the California lifestyle and The Beach Boys have become an American icon to a worldwide audience. The Beach Boys' first hit "Surfin'" (1961) launched a string of chart-topping songs that spans nearly forty years and includes eternal anthems of American youth: "Surfin' USA", "Surfer Girl", "Fun, Fun, Fun", "I Get Around", "California Girls", "Help Me Rhonda", "Barbara Ann", "Good Vibrations", "Wouldn't It Be Nice", "Rock and Roll Music", "Kokomo" and more. Their chart success alone would have earned The Beach Boys their spot in The Rock and Roll Hall of Fame (they were inducted in 1988), not to mention 32 RIAA Platinum and Gold record awards and worldwide sales estimated at more than 100 million. 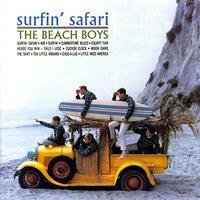 But The Beach Boys' story is one of not only commercial but also artistic success. Their unique blend of harmonies, musical arrangements and timeless lyrics still place the music of The Beach Boys among the All-Time Favorites of today's music critics. As an example, VH-1 named "Pet Sounds" as the #3 album in the Top 100 Albums in Rock 'n' Roll History, as judged in a poll of musicians, executives and journalists. The Beach Boys were honored at the 2001 Grammy Awards, receiving The Lifetime Achievement Award from the Recording Academy.